Wood frogs – male or female? With the wood frog season just about upon us, I thought it would be timely to post a little guide on how to tell apart male and female wood frogs. One obvious way to tell them apart can be found in last week’s post: male wood frogs call, and female wood frogs do not. But what if you don’t observe them calling on the road? During the breeding season, one way to tell the sexes apart is to look at the thumbs. 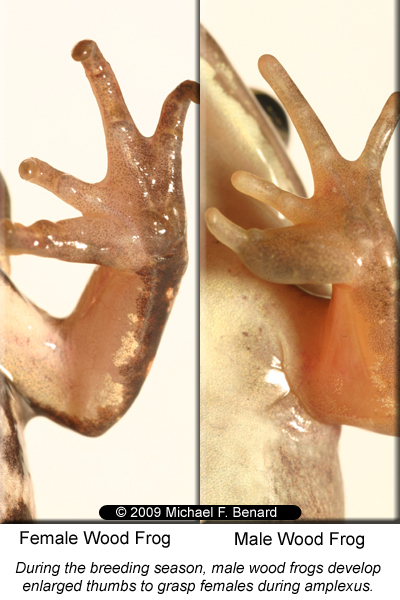 As shown in the image below, male wood frogs have a substantially enlarged thumb and forelimb. This enlarged thumb and forelimb allow them to cling tightly to the back of female wood frogs during mating. Unfortunately, this trick only works around the breeding season. This entry was posted in Natural History and tagged Frog, wood frog. Bookmark the permalink.